Roman remains, traces of ancient walls, the Jewish quarter, the Gothic Cathedral and the most important palaces. We could go on and on listing the marvels of the Gothic Quarter, the oldest nucleus of the city and the quintessential historic centre. With its little streets, tiny squares and innumerable legends hidden away, El Gòtic is the place to find the essence of the oldest Barcelona. Wherever you look there are details that speak to you, almost whispering in your ear, about the city's history. Entering the Gothic Quarter is to make for Barcelona's origins, the place where two thousand years ago the Romans founded Bàrcino. Today, we can follow the traces of that Roman city thanks to preserved fragments of the walls that encompass a perimeter which still marks the typical layout of a Roman town. 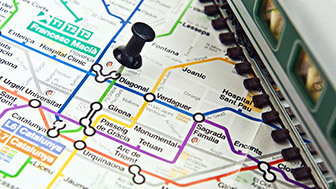 The cardo, located along today's Carrer Llibreteria, the decumanus along Carrer Ciutat and the Forum, where Plaça Sant Jaume is today, in the centre. Very close to this square, going up Carrer Paradís to the doorway of the ramblers' club, the Centre Excursionista de Catalunya, you can find a millstone that signals the highest point of Mont Tàber, a hill rising 16 m above sea level and, inside, hidden in the patio of this Gothic building, four columns are preserved from the Roman temple that stood at this point. Roman Bàrcino was transformed into Medieval Barcelona, and at the hand of the counts and kings it became one of the most splendid cities in Christian Europe. The Jews who settled in Barcelona clustered around El Call, a network of narrow, chaotic streets with a multitude of houses, among which we can still find vestiges of that time, like the main synagogue, one of the oldest in Europe and which can be recognised by the hole on the right-hand side of the lintel. 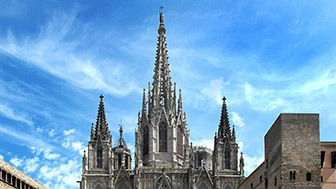 The Middle Ages brought with them commerce, the arts and the professions, the appearance of the sober Romanesque style in buildings like the Capella de Santa Llúcia, a chapel integrated into the Barcelona's cathedral, and the Gothic explosion, with the cathedral being the prime example, as well as other numerous unique buildings. 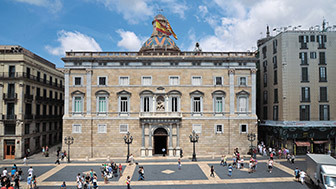 Plaça Sant Jaume became the home of the city council and since then it has been the seat of Barcelona's main political institutions, the City Council and the Catalan Government, in the two imposing Gothic buildings that face each other across the square. Barcelona Cathedral is one of the city's most iconic monuments.